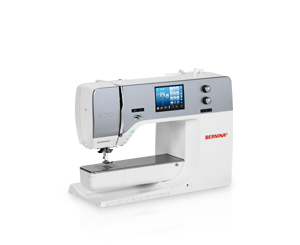 BERNINA 770 QE - A lot of space for big art work For American quilt artist Tula Pink, the BERNINA 770 QE is something very special: “Next to my passion for my designs, I’m equally passionate about BERNINA. The BERNINA 770 QE gives me the space I need for quilting, plus the Stitch Regulator can’t be beat for even stitches.” Tula Pink plays with images the way a poet plays with words, turning innocuous traditional designs into mischievous little critters. Tula’s love affair with textiles began early and an obsession with sewing soon followed. Tula began quilting in an effort to use up her ever-growing stash of fabric so that she could justify buying more. Today, 16 years later, she is a renowned designer and quilter. Tula Pink has designed a quilt from her “Moonshine” fabric collection exclusively for BERNINA.